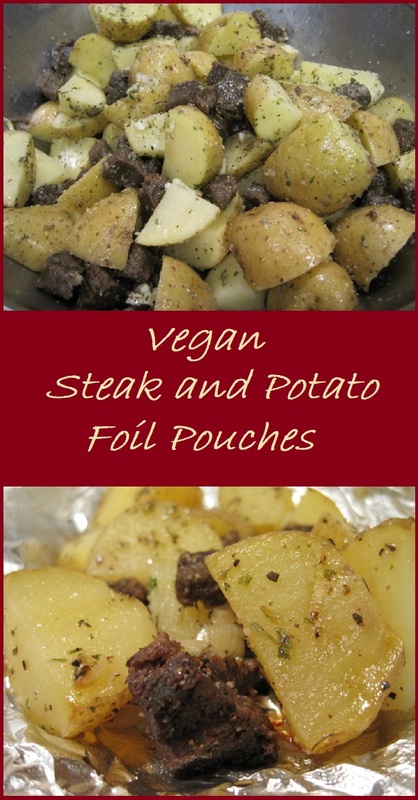 Vegan Steak and Potato Foil Pouches is not a typo, though it is a strange name for a recipe post. This all began when Bus Boy asked me if I could make garlic steak and potato foil packs for dinner. I told him they weren’t vegan, and he politely asked me if I could please, Please, PLEASE, make them vegan. How could I refuse my firstborn? I had to make them vegan for him. How hard could it be? Aside from the steak, this recipe was already vegan. I just had to find a steak substitute. It took a couple of days before I came up with an idea, and Vegan Steak and Potato Foil Pouches were born, and if I do say so myself, they are delicious. A word about TVP beef chunks before I proceed. TVP stands for Textured Vegetable Protein. TVP is a defatted soy flour product, and is a byproduct of extracting soy bean oil. It’s used in lots of commercial products as a meat replacement or meat extender. In their dry form, these TVP beef chunks looked more like kibble (dog food) than meat. In fact, Food Critic wandered into the kitchen and saw the cup full of TVP and asked what I was doing. I told him I was making dinner. “Mom, that’s dog food.” He was genuinely concerned. I tried to reassure him that it was “dehydrated meat”, but he wasn’t a believer. He went to talk to Baker’s Man. I didn’t hear Baker’s Man’s response because I was too busy laughing. 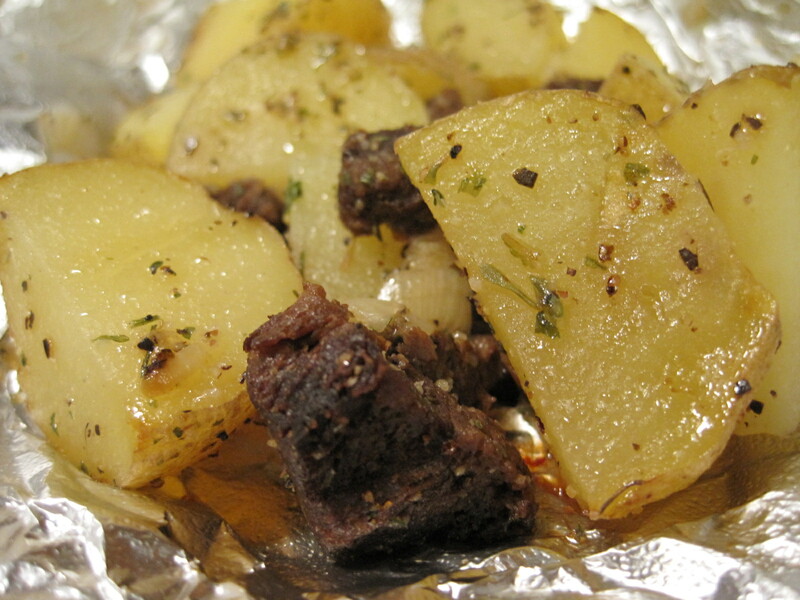 When it was time to assemble my Vegan Steak and Potato Foil Pouches, I drained my “beef” chunks and added them to a bowl with my quartered potatoes. I covered everything with the oil, herbs, and spices, and divided the mixture between eight foil sheets. I cooked half of these in the oven at 425 degrees, and the other half I prepared on the grill for 10 minutes on each side. These were delicious, and Baker’s Man said that if he hadn’t known they were vegan, he would have believed he was eating meat. 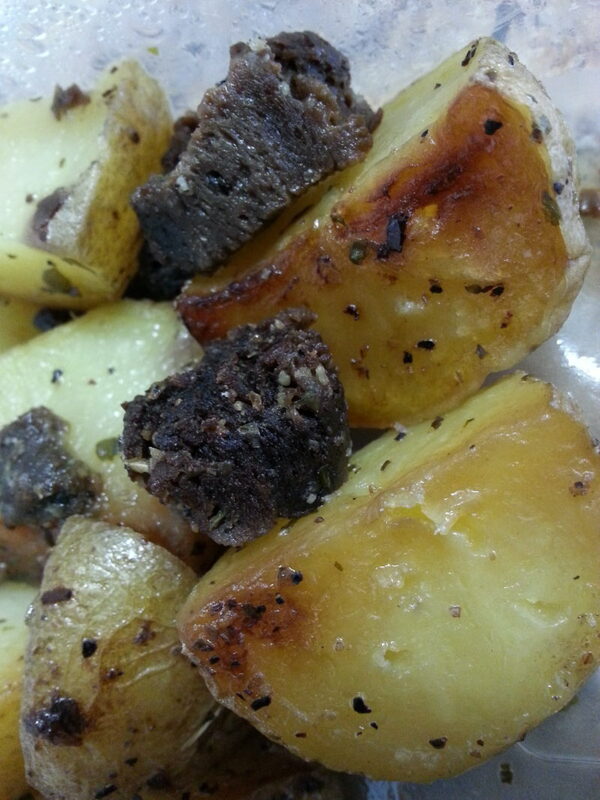 Give our recipe for Vegan Steak and Potato Pouches a try and let us know what you think by leaving a comment below. 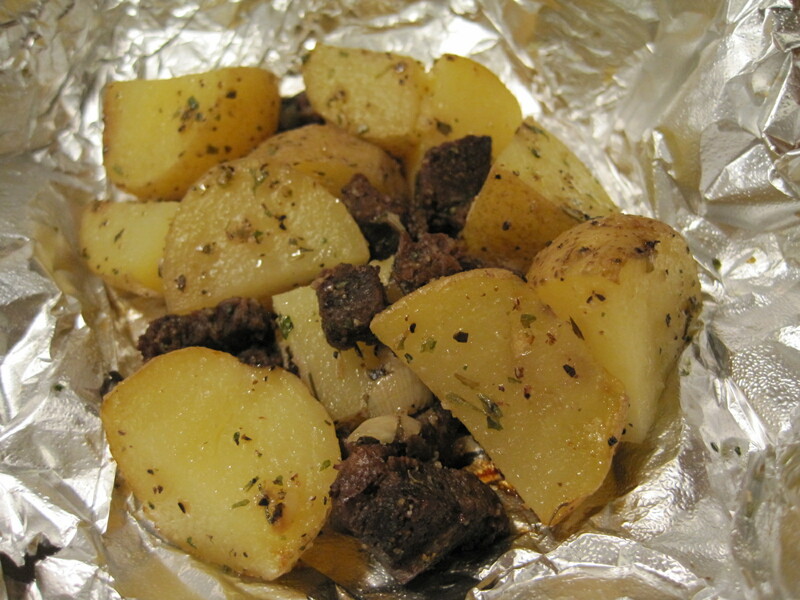 If you’re not a vegan, head over to Creme de la Crumb and check out the recipe for Garlic Steak and Potato Foil Packs that inspired this one. This recipe, made from textured vegetable protein is a simple and delicious combination that's perfect for grilling season or for baking int he oven. My carnivorous husband claimed that he wouldn't have known he wasn't eating meat if I hadn't told him beforehand. Total cost of this recipe is $3.80 or about $0.48 per serving. Combine water, better than bouillon, and A1 steak sauce in a sauce pan, and bring to a boil. Add TVP chunks, reduce heat, and simmer for 10minutes. Remove from heat, cover pan, and allow to sit for 15 minutes. Quarter potatoes and place in a large bowl. 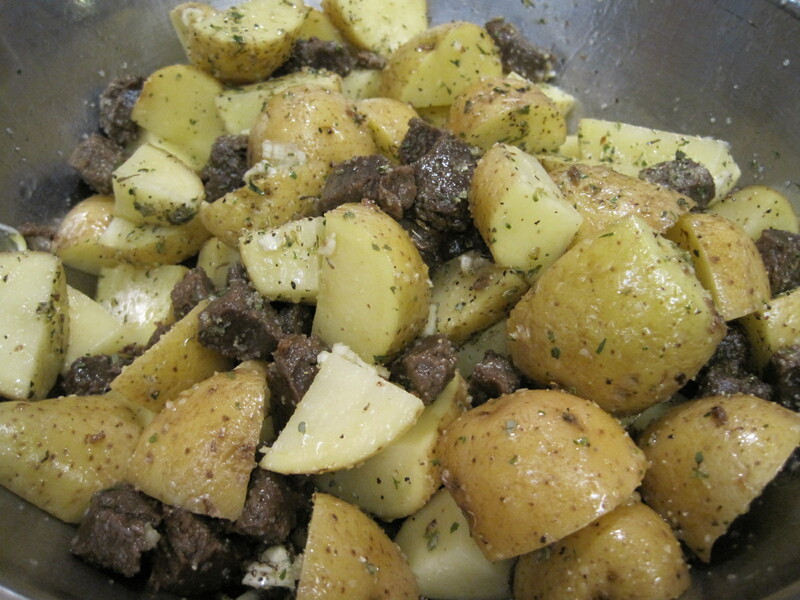 Drain TVP chunks and place in bowl with potatoes. Add olive oil, garlic, granulated onion, dried oregano, dried parsly, thyme, salt, and black pepper, and toss well to combine. 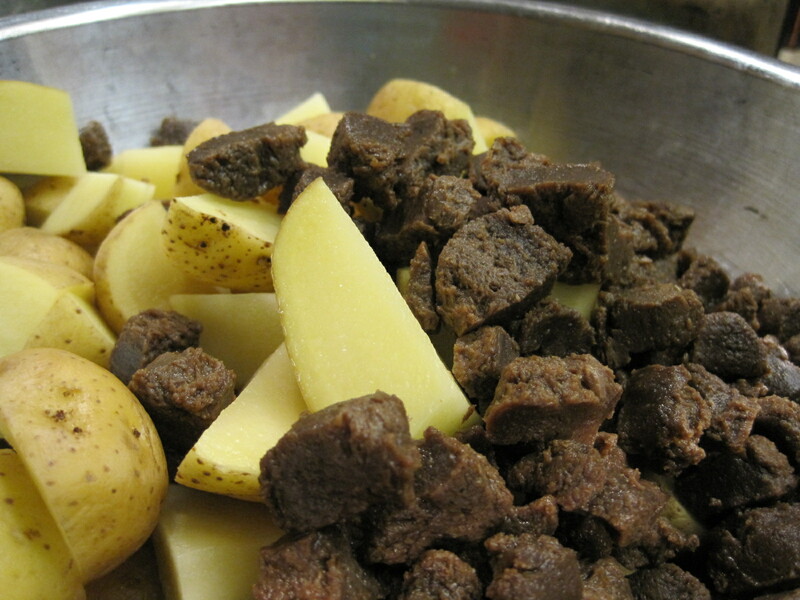 Divide "meat" and potato mixture among 8 pre-cut foil squares (about 12 inches in diameter). Seal both ends and the top. Place foil pouches on a cookie sheet and bake at 425 for 20 - 25 minutes or cook for 10 -12 minutes on each side on the grill. Nutrition information is for one foil pouch full of Vegan Steak and Potatoes. This recipe is fantastic but what I really loved was the story on how Food Critic reacted. Too funny! I do love foil pack dinners. Sharon, I love foil pouch dinners, too, and everyone who tried this was pleasantly surprised at how good it tasted. Food Critic really believed that I had scooped dog food into the bowl to rehydrate. The foil pouch dinner is always a favorite at my house. I can’t wait to try these on the grill! Thanks for sharing! I know what you mean about foil pouch dinners. I told my husband that I plan to make a whole bunch of different foil pouches this summer. They are such an easy way to get dinner on the table in the heat of summer without heating up the house. i would have never guessed them to be vegan…this is really interesting and you cant go wrong with foil pouch dinner. Dixya, that’s exactly what Baker’s Man said. He wouldn’t have guessed they were meatless, but he wanted to know if I could find bigger “beef” chunks for the next time. This looks SO delicious! Love that this recipe is vegan and can be made in a foil pouch. Perfect for dinner this week! We really like this recipe, and it was very simple to prepare, too. Hmmm… super interesting. I am not a vegan, but I am always open to trying meat replacements and this seems really interesting. We really enjoyed this recipe, and my husband, Baker’s Man, said that this meat substitute would have fooled him if he hadn’t known it was TVP. Kim,this is a great meat substitute. It absorbs flavor from whatever you add to it, so the possibilities are endless. It seems like my vegan and vegetarian list of friends and family is continually growing. Now I know what to feed them that will also fool my carnivore husband! You sound like a good friend. Several years ago, I was vegetarian for about a year. My friends kept trying to cure me by serving meat laden dishes. My revenge was to serve them vegetarian meat substitutes. TVP definitely fools carnivores. My friend used the “chicken” pieces in jambalaya and her family never suspected. Heather, Food Critic definitely keeps me on my toes. He has strong opinions. Thank you for the compliments. Keeping Baker’s Man happy while eating vegan has been a challenge. Garlic is his favorite seasoning, so that helped. Looks like the quality of the TVP products has improved over the years – the ones a friend of mine kept using years ago were intended to resemble ground meat, and weren’t very good. (Or he wasn’t a good cook – that could have been a factor! LOL) But yes, the flavor (or lack thereof) was certainly an issue, so the marinade sounds good. Those chunks look pretty convincing! The secret to good tasting TVP is to have a flavorful marinade. I’ve tossed them dry into a pot full of chili and rehydrated them in teriyaki sauce to add them to a broccoli beef type entree. What a great combination of flavors! I We love potatoes, so I know this recipe will be a hit with my family! Sara, I hope you try it. I know your family will love it. Ohhhh, I’m vegan and I bet you could use jackfruit in this recipe too! I have some so was thinking I could make this during the week for my man. Thanks for sharing. Deborah, I thought about jackfruit, but they look so scary. I know another, vgan, blogger how uses them in “pulled pork” type sandwiches.